Hale Halawai is a public pavilion in the heart of downtown Kona. Not the most luxurious setting, but offers a large reception area for a lower budget wedding. 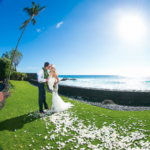 This venue is right on the ocean with a beautiful coastline with stunning blue ocean and black lava. Their is a grass area outside the pavilion where you could have a ceremony.